Step your dog into the harness, pull either side up and clip neatly and swiftly over the back of your dog. Fasten your lead to the joined rings at the back by the clip and you're ready for the next adventurous walk with your dog! 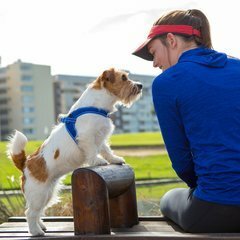 The Small Harness fits a dog's chest girth of 41cm and is suitable for Terriers and similar sized breeds.